I live in St.Petersburg, second biggest city of Russia. I've been collecting records for more than 10 years. Having discovered the features of the Internet I realized the new, great opportunity to fill my collection. Finally, here is the 1st version of my site. I shall be thankful for ANY suggestions, commentaries, questions and of course TRADE OFFERS! Dear collectors, music fans, traders! 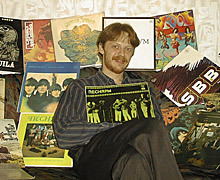 This site is dedicated to Russian rock music, Russian vinyl, Russian CD's.